Preheat oven to 350°. 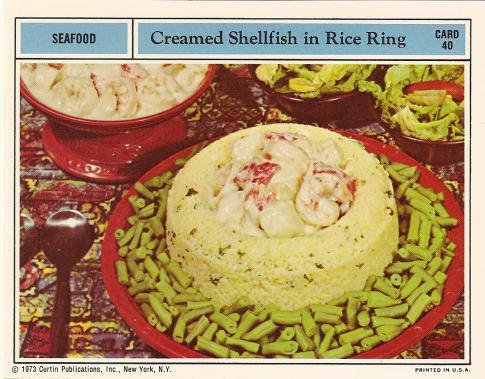 Combine rice with parsley and pack in an oiled ring mold. Set in a pan of water and bake 10 minutes. Meanwhile, melt butter in a large heavy pan. Saute scallops slowly; remove from pan and set aside. Stir flour and salt into butter and cook over low heat 3 minutes. Slowly stir in milk, cream, wine, and Tabasco. Cook, stirring until sauce thickens; add Parmesan. Fold in scallops, crabmeat and shrimp; heat through. Invert rice mold on a serving platter; fill center of ring with creamed shellfish. Nice served with cooked green beans surrounding the rice ring. Why? Seriously! Whyyyyyyyyyyyyy! Why would anyone make that! Or eat that! BLECH!! !